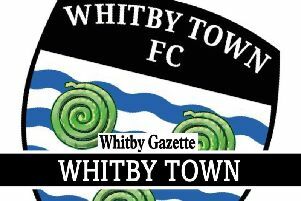 Whitby Town manager Chris Hardy’s weekly column. After two really disappointing results at Buxton and Ilkeston, Saturday’s home game with Marine has become a ‘cup final’ for us. We have to win the match to give ourselves a chance of staying in this league. We went in to the fixtures at Buxton and Ilkeston thinking that we would be able to get points on the board, indeed Monday’s match was one that we highlighted as being a game we really needed to win. Our failure to do so has lumped even more pressure on us to get a victory against Marine. I imagine that it is going to be a nervy affair as neither side can really afford to lose the match, but we will have to find some inner strength and make sure that we are on our game and also mentally tough enough to win. It is also crucial that we take our chances, something that we did not do at Ilkeston. We should have probably had a two-goal cushion after dominating the first half an hour, but we weren’t good enough in front of goal. Instead, our opponents were awarded a penalty for handball that you often see not given, then we gave away a poor second goal, and suddenly the momentum had shifted. I reckon Ilkeston will only have had 35% of possession on the night, but despite us playing well at times and making them look very ordinary, we haven’t been good enough in the key moments of the match. We applied ourselves well after the break, but as was the case at Buxton, we had given ourselves too much to do having gone into half-time 2-0 down. Scoring three goals in 45 minutes is a big ask and words needed to be said at the interval. It is a case of finding the right words however, as although it needs to be acknowledged when things aren’t right, you need to keep the players positive with so much still to play for. The positives from these games are that the players have shown character and responded in the second half and made a fist of it, when it would have been easy for them just to feel sorry for themselves. It has also not helped us having five of our first team players missing recently, this was always likely to impact on results. Thankfully, Kieran Weledji will return against Marine, while Dave McTiernan and Dale Hopson may be fit enough to play some part.